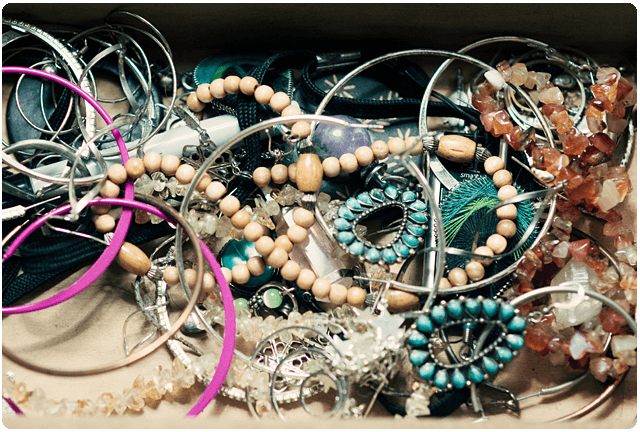 I’ve never been a very organized person and I feel that my jewelry box shows that part of my personality! I’m glad I’m not alone LOL! I gave up trying. If the stuff is OUT of the jewelry box, sir nummies tries to make off with it all sneaky like and I end up missing earrings! Fun topic! Mine looks a little better than yours, but only because I sat down and organized it when I was doing the fashion challenge in September… I realized I never used half of what I have because I kept forgetting what I owned! OH yes. I tend to use my earrings that have turquoise the MOST often and everything else tends to get unused for months. done with the place, and congratulations on your beautiful family! OH yay! I suppose that’s the one good thing about keeping a domain name as long as I have LOL, easy to find and remember! Mine doesn’t look any better even though I have a jewelry armoire. I love that we get a glimpse of your personal style in this photo though. It’s kind of intimate. Thank you! I never know what to do with all of it. I really like this one! It’s gorgeous, great color, and so simple that it’s perfect. This is going to be a fun project! Thank you so very much! I just hope I can keep it up! AHH if only you lived closer, I could hire you as an “Organizational Expert”! !